The group was initially formed in 2001 as a result of a widespread food and mouth related ban on all off road, hill walking and mountaineering activities in Ireland when a ragtag group of recreational cyclists and along with orphaned hill walkers (some under duress) ,who were co-opted into to dusting off their bikes, took to the open roads. Since then there have been many saddles raised, punctures fixed, fig rolls eaten, hills climbed, bikes bought and replaced and the group has gone from strength to strength. In 2007 the group secured its first sponsorship from a local Tralee bar; The Blasket Bar & Restaurant, and Eamon Costello Contractors (Kerry) and added their names to a dashing new black, blue and orange kit. The club went from strength to strength with membership raising steadily from 55 in 2009 to over one hundred by 2011. In 2013 the club made it’s first continental strides to the French Pyrenees for the first club holiday. 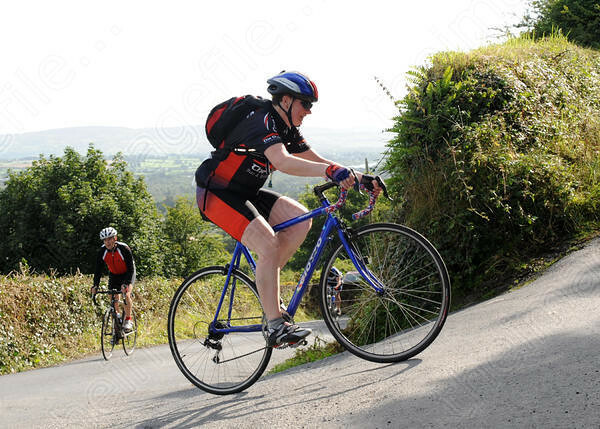 Here the club members played out the gruelling Tour de France climbs of the region. In 2015 a similar venture was undertaken, with about 40 members descending on the French Alps. In 2014 the club changed its main sponsor to The Meadowlands Hotel (our Saturday starting point). With that a new kit was designed and ordered, changing the colours to yellow, purple and white. One of our original sub sponsor Eamon Costello (Kerry) Ltd remains loyal to this day. Our other sub sponsor are 4 Site Telecoms. 2017- 2018 the club has gone from strength to strength. Over 160 members, regular cycles on a Saturday, Sunday and Thursday plus a structure of 5 individual groups. In April 2018 we moved back to our more traditional style kit colours with a red, white and black design. Summing up – the whole club has been a great success from such humble beginnings. Many friends made, miles cycled, places seen, coffee drank, scones scoffed, punctures repaired. The sportives, foreign trips and so much more. Hats off and Kudos to everyone involved for putting in the work and miles making this whole club possible.